Included is an Unlocked Apple iPhone 5 Space Gray with 16GB. The iPhone was originally contracted with AT&T back in fall 2012 and has remained unlocked since fall 2014. The phone itself operates well and runs on iOS 10.3.3. This iPhone is for use with Verizon and is also Unlocked for GSM carriers like AT&T, T-Mobile and MetroPCS. iPhone has been fully tested and reset to factory settings by a certified technician and is in fair cosmetic condition with moderate wear and tear including scratches, scuffs, dings and blemishes present. Comes with a compatible USB cable and wall adapter. No SIM card is included. RARE! BRAND NEW APPLE iPhone 5 BLACK, 16GB VERIZON, AT&T, GSM UNLOCKED! - iOS 8! Model A1429 / ND097LL/A - iOS 8.4.1. - FACTORY UNLOCKED FOR: VERIZON, AT&T. 16GB Black iPhone 5, iOS 8.4.1. Apple iPhone 5, 16GB . ALL GSM CARRIERS U.S.A. & WORLDWIDE! UNLOCKED FOR USE WITH ALL. 4.5 out of 5 stars - RARE! BRAND NEW APPLE iPhone 5 BLACK, 16GB VERIZON, AT&T, GSM UNLOCKED! - iOS 8! 16 product ratings16 product ratings - RARE! BRAND NEW APPLE iPhone 5 BLACK, 16GB VERIZON, AT&T, GSM UNLOCKED! - iOS 8! New ListingApple iPhone 5 (16GB) Black & Slate (AT&T) A1428 (GSM) <407295> Tested Perfect! Known issues: None. Tested Good. Everything on this phone tested good for functionality when audited. For Parts = Read "Known Issues" All KNOWN issues are disclosed. Unknown issues may arise due to the condition of these devices, for which we cannot foresee. 4.5 out of 5 stars - Apple iPhone 5 (16GB) Black & Slate (AT&T) A1428 (GSM) <407295> Tested Perfect! 168 product ratings168 product ratings - Apple iPhone 5 (16GB) Black & Slate (AT&T) A1428 (GSM) <407295> Tested Perfect! ON SALE: 100% functional used Apple iPhone 5 A1428 16GB GSM Unlocked iOS Smartphone in GREAT (see below for definition) physical condition. 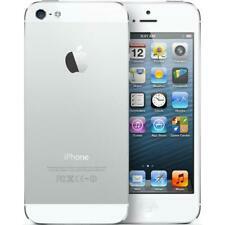 Apple iPhone 5 A1428 16GB AT&T GSM Unlocked iOS Smartphone in GREAT physical condition. Storage: 16GB. Type: Apple iPhone 5. Working Condition: Good. Appears to be fully working with no known issues. Apple iPhone 5 - 16GB - White & Silver (Verizon) A1429 (CDMA GSM). Condition is Used. Shipped with USPS Priority Mail. Model: A1429. Storage: 16GB. Network: CDMA (Verizon & Sprint). Going green, and recycling is a necessity of the future. Condition: Product has been tested and is in good working condition. It has been reset to factory default settings. A1429 (CDMA GSM). The slim design is attractive and easy to handle. GSM / EDGE / CDMA Ev-Do REV Ritter. a and REV Ritter. B / UMTS / HSPA / DC-HSDPA / LTE. Apple iPhone 5. Storage Capacity. Apple iPhone. Trending at $56.66eBay determines this price through a machine learned model of the product's sale prices within the last 90 days. Apple iPhone 5 16GB -Smartphone Black & Slate. This iOS phone has a battery of 1440 mAh. In addition, this black and slate phone supports 2G/3G/4G networks. Manufacturer Color Black & Slate. Storage Capacity 16GB.